The jury is out on whether setting New Year's Resolutions is a good idea or not, but personally, I feel there is never a bad time to reflect on where you are and start making some positive changes. The important thing to remember is not to try and change everything at once. If you want to build new positive habits, aim to introduce just one, maximum two, at a time. More than that and you'll be overwhelmed and you'll find yourself going back to your old habits faster than a bottle of Verve disappears on New Year's Eve! 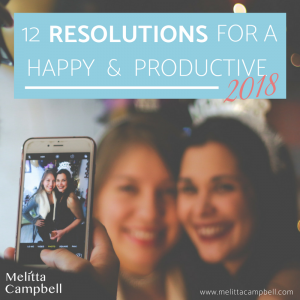 Stuck for ideas, here are 12 New Years Resolutions ideas to help you enjoy a happier and more productive 2018. This is such a simple habit to start and it will have a profound impact on your life and happiness. Find a notebook that you love and commit to writing in it every day, listing 3 or more things that you are grateful for. Most people do this first thing in the morning or last thing at night. Not sure what to write? Here are some ideas of what you might be grateful for: events in your life, the unique possessions, skills or opportunities you have, people who have helped and supported you in some way, moments when you've felt happy or loved, things you've learned...you can even list things that you will be grateful for in the future. When you start your day right, you become happier and more productive throughout your entire day. There are lots of options, but the idea is that you get up without hitting the snooze button and set yourself up for a great day ahead. There are so many great benefits to reading. As well as giving yourself a knowledge boost and mental stimulation, reading can improve your memory, expand your vocabulary, improve your ability to focus, inspire you to greater success. Not sure what to read? Check out these Inspiring Books. Just like reading more, walking more has lots of benefits besides keeping your waistline trim - which is reason enough already! As with all forms of exercise, walking prompts the brain to release 'happy' chemicals like serotonin and dopamine, that can lift your mood both during and after your walk. Walking can also lower stress and depression, strengthen your body and bones and ward of disease, with walking outdoors being more beneficial than a treadmill. It's also the cheapest way to get exercise into your day...so no excuses, get out there already! Mobile phones have become an important part of modern life, but we don't need to be attached to them 24/7. Make a resolution to take some time to unplug every day and enjoy the people and environment around you. You already know that your family and friends will enjoy more quality time with you, without the distractions, and your health and happiness will also benefit. Get out of that pasta pesto rut and expand your culinary repertoire in 2018. It's not only fun, but can help build your self-confidence and support your good health. The great thing about most healthy recipes is that they usually contain around 5 ingredients, making them quick and easy to prepare. You'll no longer have to rely on the pizza-delivery man and you'll save a fortune on expensive ready-meals! Why not invite a friend or two to enjoy your creations with you? Need inspiration? Check out my Healthy Recipe Pinterest Board. Learning something new requires you to grow in some way, which is always a great feeling. It also gives you access to people and opportunities you wouldn't have otherwise had, builds your self-esteem and confidence, provides mental stimulation and can be a lot of fun toboot! For this resolution, list all the things you've ever wanted to try out or improve, choose one, find a class or group that focuses on that subject and go for it! What about trying your hand at painting or pottery, you could join a local cookery class, Toastmasters is a great way to grow your leadership and communication skills while also building your network and confidence, visit your local sports centre and see what inspires you or ask your friends and colleagues what they do they you might also enjoy. Did you know that how you eat can impact your health and weight almost as much as what you eat? Today we are always in a rush and with that comes the temptation to eat fast and make unhealthy food choices. Being more mindful of your eating practices is a simple way to counteract this. Not sure where or how to start? Here are some simple techniques you can use to practice Mindful Eating. Many people fear networking, but it's a powerful way to boost your career, business, knowledge, confidence and more! Find some networking events or groups close to you that are focused on a subject that is relevant and interesting to you, then make it your resolution to go at least once a month. As an introvert, I used to avoid networking like the plague, but once I decided to go for it, I actually started to enjoy meeting new people and, over the years, my network as supported my new ventures and kept me inspired. Check out this post where I share my best tips on how to start a strong network from scratch. If you want more money, growth and fun in 2018, why not start your own business? With as little as 10-hours a week, you can start a business from home that you can fit in and around your existing commitments such as a job, studies or a family. 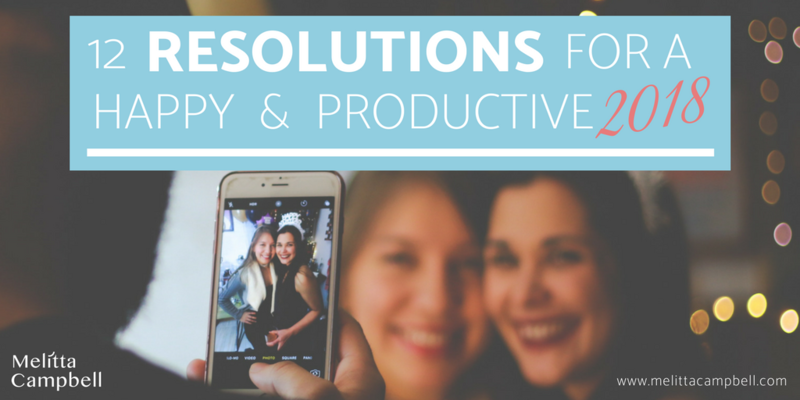 This resolution is easier than you might think. Some home options even provide you with free training and coaching, making it an inexpensive way to learn new skills and meet new people too! You'll find some helpful advice in this article on Why You Should Start a Home-Business in 2018. Or check out my eCourse 8 Steps to Your Business Success and start working towards your business success today?! It might sound a strange thing to aspire to, but failure can be a very beneficial as it shows you are trying something new. Life rarely goes according to plan, especially when you are pushing boundaries, learning new things and aiming high. But the unexpected can be a great mentor - you see we learn more from our mistakes than we ever do from what goes right first time. Don’t let the fear of failure hold you back from this resolution. Instead, let it be the fuel that moves you forward! So embrace failure and recognise that it's part of the process of making a difference, having an impact and creating success. It's not just me who believes that failure is good for your personal and business growth - check out these inspiring quotes on failure. Since we looking at resolutions that will make you feel happier, the list would not be complete without including smiling. Make a conscious effort to smile more in 2018 and it will do more than just make you feel happy. Smiling relaxes the facial muscles and calms the nervous system helping to reduce stress levels. It helps us connect with others and since smiling is contagious, your smile can spark a whole wave of happiness around you. Looking for more success or a new partner? Smiling can make you more attractive and so could help you land that dream job or find Mr. Right. What resolutions will you be making? Have you set out your resolutions yet? What changes are you planning to make? What's worked well for you in the past? Share your ideas and experiences in the Comments section below! 9 Ways to Improve Your Health – Even When You’re Too Busy! That’s so exciting Emma – you are definitely in for an amazing year! And it’s true, as a new Mum, you will get a lot of things ‘wrong’, but in truth, if you are doing it with love, there’s no such thing as ‘wrong’ really. Take the time to enjoy every moment of your new life as a parent, my eldest daughter turned 10 a couple of days ago – the time goes REALLY fast! Wishing you a wonderful 2018! I absolutely love this !! Thanks so much what awesome ideas ! Thanks Melissa! Wishing you an amazing New Year filled with joyful journeys, sparkling moments and abundant success. This article is perfect! Thank you for incorporating ideas on HOW to achieve each idea– and for making it easy to tweet your great advice! Thanks Cindee, so pleased you’ve enjoyed the post! Great list! I really like the idea of a gratitude journal, I might have to start one! Thanks Rachel. I can highly recommend a gratitude journal, it only takes a couple of minutes a day, but it makes a huge difference to your mindset and positivity. Yes! Fail more and fail faster to get ahead faster. Happy to inform that this post has been mentioned in the recent part of our “Productivity Articles” roundup! You can find the entire post on our blog: https://www.timecamp.com/blog under the “Productivity Articles: Set and Keep The Goals in 2018! 2/1/18” title. Thank you so much for sharing these perfect tips!